Valentine's Day is fast approaching! See our Events page to book a serenade for your honey! It is with great sadness that Men of Fundy notes the passing of founding member Bruce Halpin January 4, 2019. Bruce will be fondly remembered for his kind spirit and uplifting presence. Our sincerest condolences go to Bruce’s extended family. On Monday evening, May 14, Men of Fundy gave a concert to the residents of the Shannex Parkland community in Millidgeville. The 1-hour concert highlighted the diverse repertoire of the chorus, and delighted the audience, especially when they were asked to sing along with some well-known favourites. 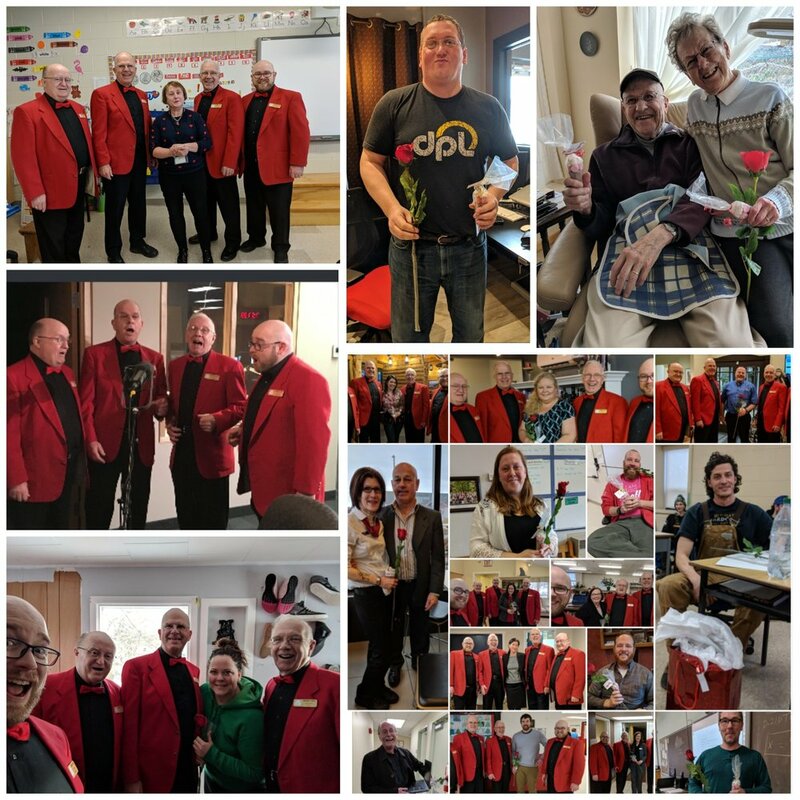 The chorus members were pleased and happy to be able to do this for the seniors at Shannex Parkland, hot on the heels of the chorus' participation in the gruelling Sunrise Division annual contest in Kentville NS, and all the travel that required. It just shows that the Men of Fundy love to share their art with anyone, anytime. The 2018 MoF Singing Valentines campaign was huge success. Our very own award winning quartet, Rising Tide, delivered 21 unforgettable serenades to sweethearts all over the greater Saint John area. The day started at 7:15AM when the guys met at CBC for an on-air PSA and concluded at 6PM when they delivered their last valentine at Montana's BBQ on the East Side. Fun Fact: we had an unusually high number of both male recipients and school teachers this year. A huge THANK YOU to everyone who helped us make this year's campaign a success. Every time you book a valentine, share our posts on social media, or recommend us to your friends you contribute to helping us fulfill our mission of MAKING MUSIC THAT MAKES A DIFFERENCE for our members, for our audiences and, most importantly, for our community. We couldn't do it without you! A special thank you as well to Stephen, Hance and Elkie at CBC New Brunswick Information Morning Saint John for having us in studio. We had 3 new bookings before we left the building thanks to your support!